The beautiful lei of real flowers given to me by ranger Honeygirl. Aloha Honeygirl and Haleakala! Last Friday was my final day of the residency and I said aloha to Haleakala and the rangers. Honeygirl gave me a parting gift of a beautiful lei, this one made of real flowers! It was an amazing month and I still have to sort through the many photos I took. I headed down the mountain to Kaluhui for two days. 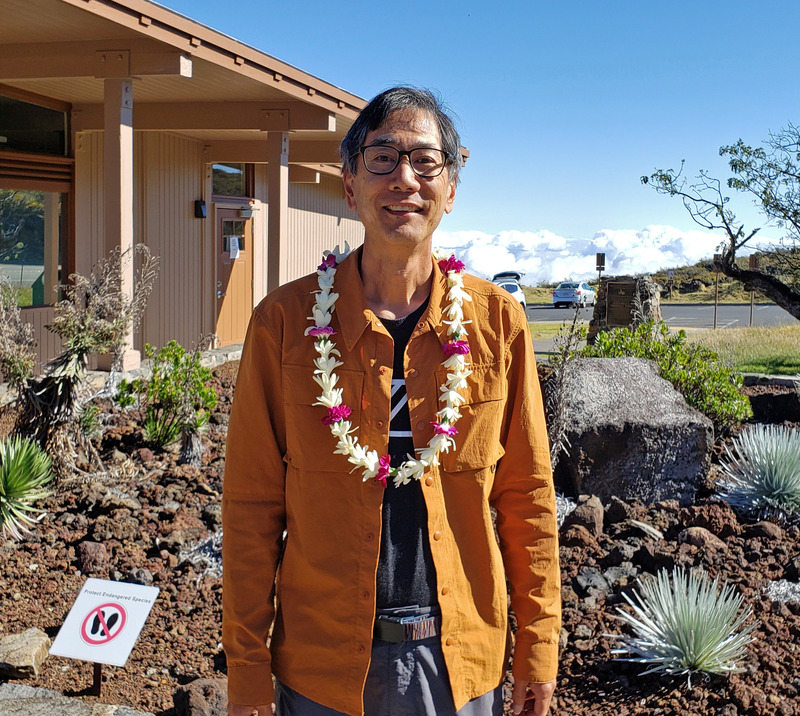 I extended the stay in Maui for a day because I got an invitation from park superintendent Natalie to come to a diner gathering at her house on Saturday night. Then I head to Ohau for another adventure. I forgot to write about two night sky photography workshops I did at the park headquarters visitors center on March 23 and 24. The rangers were quite happy to host the workshops, they announced the first one and it quickly sold out- reaching the 20 maximum participants quickly and many on a waiting list. We agreed I could do a second one the next night and that filled up fast. Many of the students were from Maui, they could easily drive up to the park any time and practice. I did a short tutorial on camera controls and settings and we headed up to the summit just before sunset. After over a week of pristine skies over the summit, the weekend brought very high clouds (higher than the 10,000 ft. summit) which threatened the view of stars. The clouds did produce two spectacular sunsets each evening of the workshops. But as night fell, a hole appeared almost straight overheard both nights, and we got views of Orion and the bright stars around it. Everyone was able to get photos of the stars. Below, some more night sky photos. 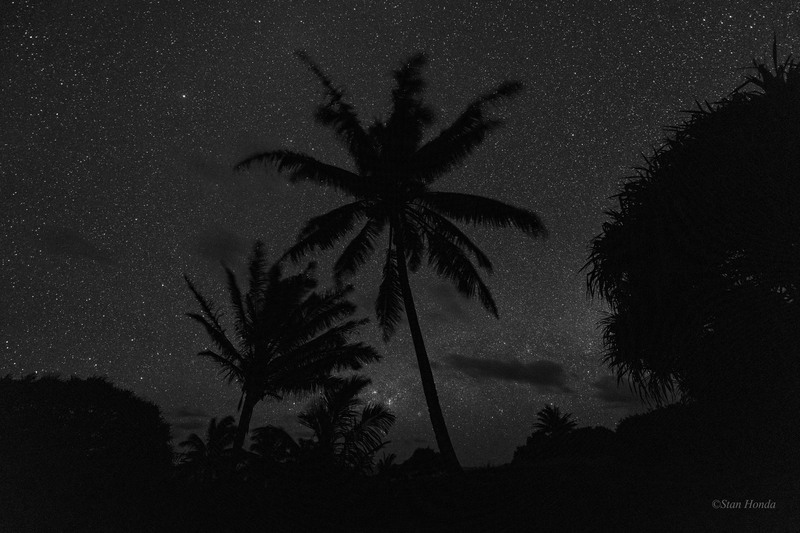 From Kipahulu here’s a black & white version of the coconut trees looking south. There was so little color in the photo, it seemed to look best this way. And from the beginning of March, I shot these ‘botanicals’ in Hosmer Grove, near the apartment and never posted them. 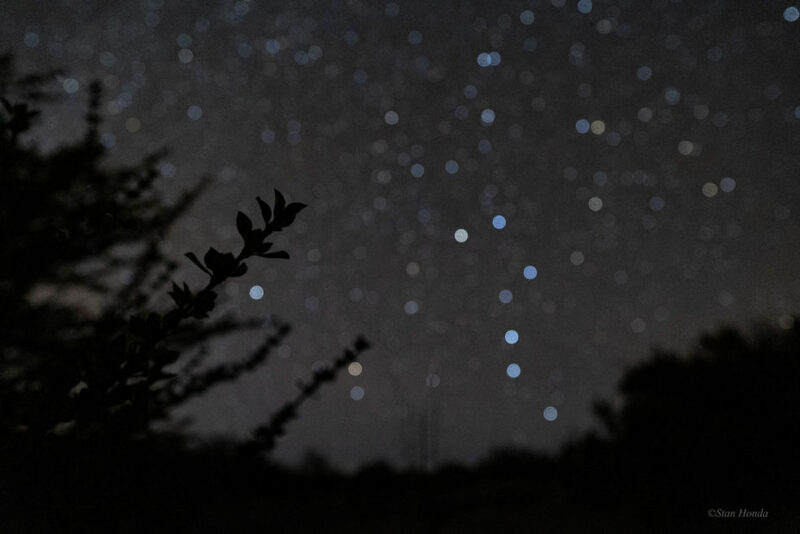 You can see the familiar patterns of the Orion constellation and the Big Dipper. Coconut trees in Kipahulu, the view looking south. (click to enlarge image). 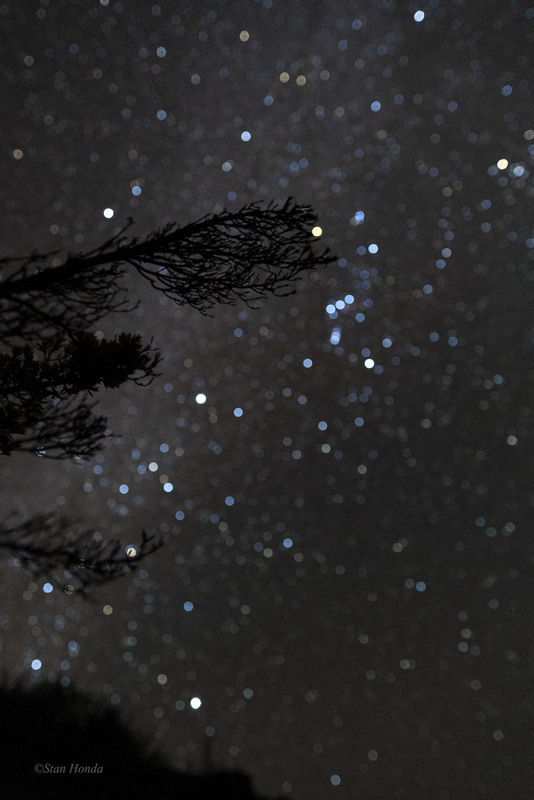 A pukiawe plant, in the background is the constellation Orion near the top branch, the bright stars Sirius (about in the middle left) and Canopus near the horizon. Canopus is usually thought of as a southern hemisphere star, at low latitudes in North America it can be seen. A pilo shrub and the northern sky with the Big Dipper standing on its handle, two stars in the ‘dipper’ pointing towards Polaris, the North Star. I always enjoy seeing the Big Dipper, especially in its bright but blurred versions. The silversword plant is strange, and tragic. The spiderweb shows nature’s perfection. And the silhouette beginning Into the Crater, part 2, has a great gaping mouth reaching up to devour the sky! What a month you’ve had!